This KitchenAid Artisan® Series stand mixer has 67 point planetary mixing action to ensure thorough mixing of ingredients and includes three mixing attachments (wire whisk, beater, and dough hook) and 10 speeds for almost every mixing job. A high-performance motor drives this stand mixer and means that it can mix tough bread dough without overloading and enough batter in one batch to make 9 dozen cookies. 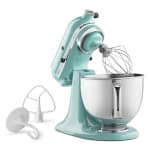 This aqua sky colored tilt-head mixer includes an attachment hub for additional uses, such as cutting pasta and grating cheese (attachments not included).